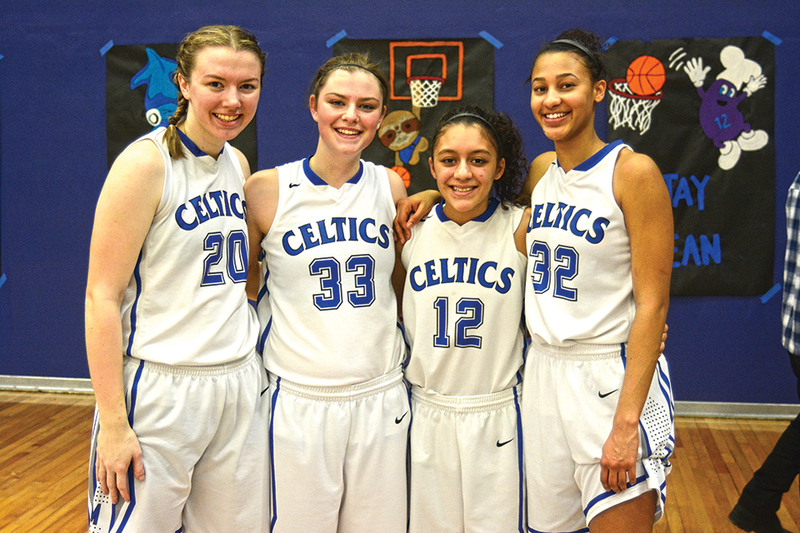 Sydney Hunter, Jaylene Montano, Gabby Schmit and Kelsey Koenig’s final home game at McNary wasn’t one they’ll likely want to remember as the Lady Celts lost to West Salem 55-44 on Friday, Feb. 17. “Inconsistent effort” and “inconsistent execution” were the reasons head coach Derick Handley gave for the loss, McNary’s third in a row. The Lady Celts fell behind 16-6 as West Salem knocked down a 3-pointer just before the buzzer sounded to end the first quarter. McNary opened the second quarter on a 7-0 run with a Schmit basket in the paint, a Montano 3-pointer, followed by a Kailey Doutt 3-point play to get within 16-13 with 4:20 remaining. However, West Salem was able to stretch its lead back out to 30-17 at halftime. Doutt, who finished with a team-high 16 points, kept the Lady Celts in the game with 10 points in the third quarter but McNary couldn’t get any closer than nine points of West Salem. A Doutt jumper made it 35-26 with 3:49 remaining and then Abigail Hawley banked in a jump shot at the 1:33 mark to get the Lady Celts within 39-30. But the Titans answered with the next eight points to extend their lead to 47-30 early in the fourth quarter. McNary closed the game on an 8-2 run but it wasn’t enough. Hawley was the only other Lady Celt to score in double figures, finishing with 10 points. Hunter had seven points and seven rebounds in her final home game. Montano added three points. Schmit finished with two points and four rebounds. Koenig chipped in with a rebound. “They’re different but all four of them are incredibly vital to what McNary has meant over the last four years to the program,” Handley said of the seniors. “Sydney is one of the better players in the state and is going to play Division I next year but you have three others girls who are the best teammates you’ll ever find.